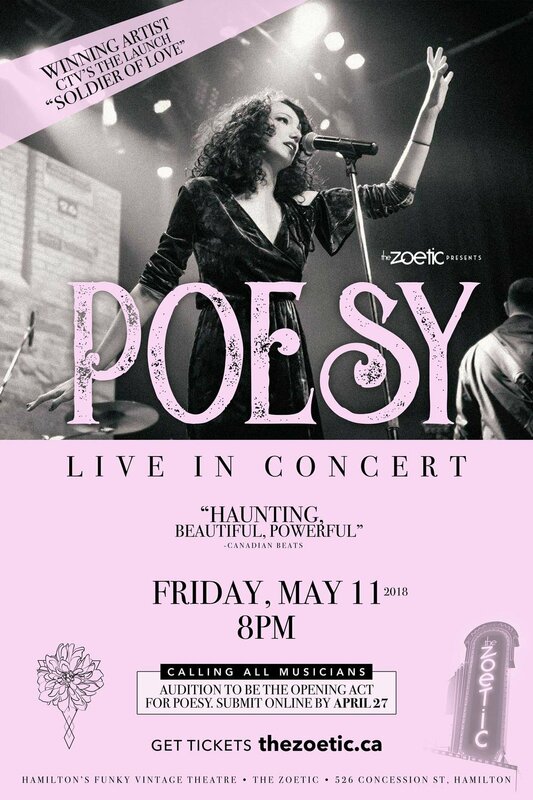 The Zoetic is proud to present POESY: Live in Concert. A winning artist from CTV's The Launch, POESY has been top 40 for eight weeks with "Soldier of Love" (which is also the promo song for TV's This Is Us). Not only is she an incredible musical talent, but she's also a hard-working inspiration, and we're honoured to bring POESY to Hamilton's Funky Vintage Theatre. Between her mononymous name and her distinctive, powerful voice, there’s something truly mysterious about POESY. After writing her first song at age 9, POESY has been making a name for herself on Canada's music scene, sharing the stage with acts such as Hollerado, Sloan, FeFe Dobson and Mother Mother. Her songwriting is inspired by literature, 1970s rock, thrift stores, and bus rides, while her sound and style is inspired by the likes of Freddie Mercury for his charisma, Stevie Nicks for her enchantment, Dolores O’Riordan for her power, and Kurt Cobain for his honest raw lyrics. Get ready for a powerful night of music. CALLING ALL MUSICIANS: We're excited to create an opportunity for burgeoning new musicians with an open call for an Opening Act. Send us your audition video by April 27 and POESY will help us choose her opening performer!